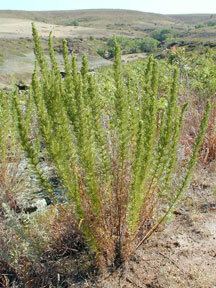 Artemisia campestris L. subsp. caudata (Michx. ) H. M. Hall & Clem. Also Called: Field sagewort, field wormwood, thread-leaf sagewort. Stems: Erect to ascending, one to occasionally several from taproot, usually unbranched, glabrous. Leaves: Alternate; basal leaves numerous, 1 to 4 inches long, .2 to 1.6 inch wide, may be absent in second year, glabrous to silky-pubescent, deeply pinnately-divided 2-3 times, ultimate segments linear to thread-like, 1/50 to 1/12 inch wide; stem leaves similar, reduced upward, less divided. Inflorescences: Panicle, narrow, elongate; heads numerous; involucre 1/10 to 1/6 inch tall, usually glabrous, bracts overlapping. Flowers: Erect on short stalk, droops when mature; florets green or yellowish-green; outer florets pistillate, fertile; center florets sterile. Fruits: Achene, nearly cylindric, glabrous, 1-seeded; seeds tiny. Habitat: Pastures, prairies, roadsides, waste places; open sandy sites. Toxicity: Toxic, but poisoning is rare. Forage Value: The fruits are eaten by rabbits, small mammals, and grouse. Uses: Native Americans steeped the leaves and stem and used the tea to treat coughs and colds and applied the liquid to eczema; steeped the roots and applied the liquid to scalp infections, sores on the backs of horses, and rubbed on hides to be tanned; the leaves were chewed for stomach-aches and the spittle was applied to relieve rheumatism; a poultice of chewed leaves was applied to sore eyes; pulverized roots were used as a perfume and were placed on a sleeping person's face to serve as a sedative so "his horses could be stolen". Comments: Forms rosette of leaves in first year. Many members of this genus are aromatic but western sagewort is not. It is not highly competitive. Can cause allergy symptoms in late summer.